On the surface Storage: Auctions Legends looks really great. It has a free version called “Startup” as well as a paid full version for $1.99. In this game you get to choose storage lots to go to auction for, compete with bidding opponents, and generate fun profits. This game is somewhat similar to a gambling game where you have a certain set of rules that you follow, and you aim to leverage risk versus reward. To make the game more interesting, the developers added cool boosters which help you compete better. There’s the x-ray glasses, the kick-an-opponent out of bidding, guess the lot’s worth, and extra-large transporter boosts. After you run out of these various boosters, you can purchase them for an extra $0.99. The music and graphics of this game are really great, as is the content quality and depth of the levels. The free version of the game doesn’t give you much room for playing before you have to purchase the full version. Also it’s plagued by advertisements to the point where you will accidentally tap a few ads twice every minute. This game literally “tap-baits” users into clicking ads. 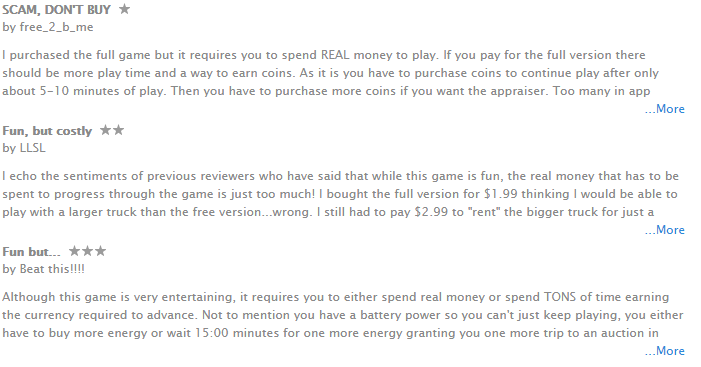 Other people who have played the full version of the game agree that even with the $1.99 payment to get the game, you can’t advance very well without spending more money on it. Unless you plan on spending over $10 on in-app purchases with this auctioning game, then your money is going to be better spent elsewhere.